Not only is this recipe delicious and decadent, it is also packed with ingredients that are great for your skin. The star in this recipe of course are the zucchini’s which grow abundantly this time of year. Vitamins A and C found in zucchinis are strong antioxidants and are very helpful in maintaining healthy and youthful skin. Vitamin A is especially important for skin health and vitamin C fights against free radicals that are harmful and cause ageing of skin like the appearance of wrinkles and fine lines, as well as spots on your skin. Water flushes out harmful toxins from your body and is very beneficial for your skin. 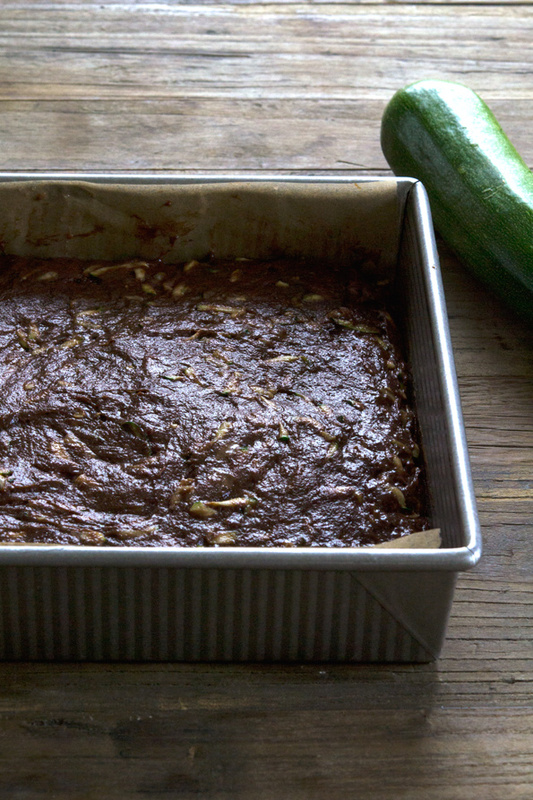 Zucchini, with high water content, helps in hydrating your skin. So eating zucchini daily will help provide you with naturally glowing skin. Collagen is necessary for a healthy skin and healing of wounds. Collagen needs the amino acid cholin for its formation, which in turn requires manganese for its production. 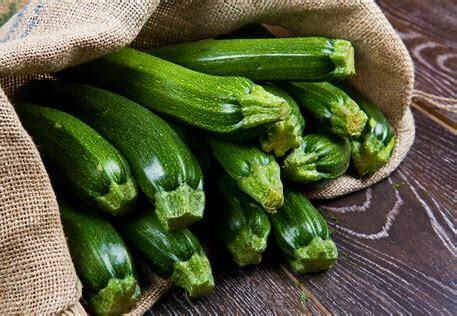 Zucchini is rich in manganese. 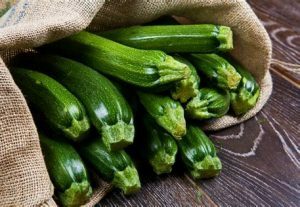 So consuming zucchini is very beneficial for the formation of collagen. *Cocao is full of antioxidants and coconut is rich in fatty acids, vitamin E and proteins all which help in repairing damage to your skin therefore keeping your skin smooth. *Cacao is the purest form of chocolate you can consume, which means it is raw and much less processed than cocoa powder or chocolate bars. Cacao is thought to be the highest source of antioxidants of all foods and the highest source of magnesium of all foods. It has been used throughout many cultures for years for health purposes. * First, make the cake. Preheat your oven to 160 degrees. Grease or line a 22cm square baking pan and set it aside. * Place the chopped chocolate in a small, heat-safe bowl over a pot of simmering water (making sure the bowl does not touch the water, and the water does not boil). Stir until almost all of the chocolate is melted. Remove from the heat and continue to stir until all of the chocolate is melted and smooth. Add the coconut oil and vanilla, stir to combine and set aside to cool briefly. * In a large bowl, place the flour, xanthan gum, cocao powder, salt, baking powder and coconut sugar, and whisk to combine well. Add the melted chocolate and coconut oil mixture, and mix to combine. Add the eggs and water, and mix to combine. The batter will be thick. Add the shredded zucchini, and mix to combine. Scrape the batter into the prepared pan, and smooth into an even layer with a wet spatula or knife. * Place the pan in the center of the preheated oven and bake for about 30 minutes, or until a toothpick inserted in the center comes out with a few moist crumbs attached. Remove the cake from the oven and allow to cool in the pan for at least 20 minutes. 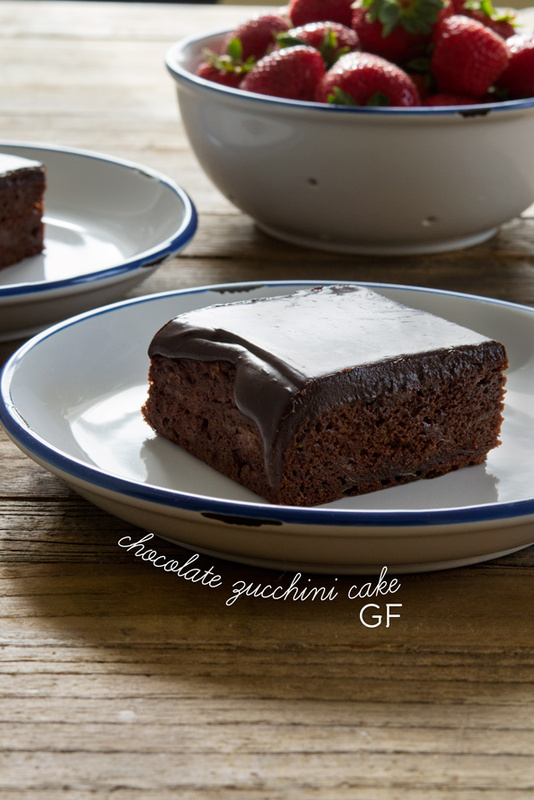 * Once the cake is cool, make the ganache. Place the chopped chocolate in a medium-sized, heat-safe bowl. In a small saucepan, bring the coconut cream to a simmer. Pour the coconut cream over the chopped chocolate and allow to sit for a couple minutes so that the chocolate begins to melt. Mix until the chocolate is melted and the ganache is smooth. Immediately pour evenly over the top of the cake. Allow to sit at room temperature until the ganache is set. For a firmer ganache, place the cake in the refrigerator for 30 minutes before slicing into squares and serving.